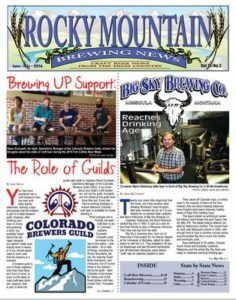 This article first appeared in the June/July edition of the Rocky Mountain Brewing News. Look for it at your favorite breweries and bars, or subscribe here. Twenty-one years after beginning their first brew, one thing remains clear: brewing Montana’s most recognizable beer remains as fun as it is successful for co-owners Neal Leathers and Bjorn Nabozney at Big Sky Brewing Co.
Leathers, Nabozney and Brad Robinson started Big Sky in 1995, in part as a way for the three friends to stay in Missoula, Montana. Their idea was big from the start. Big Sky’s business plan, born out of Nabozney final project for his finance degree at the University of Montana, called for distribution to half the U.S. 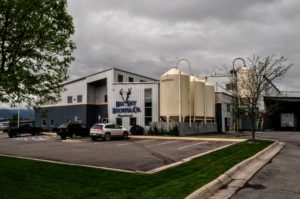 They installed a 30 bbl brewhouse and two 60 bbls fermenters just off downtown Missoula years before “craft” was an adjective applied to beer. They swore off cascade hops, a variety used in the majority of beers at the time. Instead, they set about brewing balanced, more English-style beers featuring healthy doses of East Kent Golding hops. The beers picked up whimsical names like Moose Drool Brown Ale and Pygmy Owl Itty Bitty IPA. The labels feature artwork created by Nabozney’s mother. The current facility, built near Missoula’s airport in 2002 with enough land to host a summer concert series, accommodated Big Sky’s move into bottles and eventually cans. Now distributed to 24 states, Canada, South Korea and Australia, Leathers, Nabozney and the whole Big Sky team are ready to celebrate reaching drinking age. Accounts in hand, business still started out with a near flop. Big Sky’s first beer, the short- lived Whistle Pig Red Ale, was an “ahead-of-its-time” hoppy red ale according to Nabozney. But the first batch was significantly under-carbonated when it left the brewery. Big Sky utilizes an x-ray machine to check the quality of the seal on its cans to ensure there is no way for oxygen to sneak in. 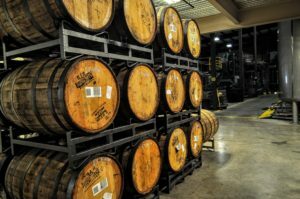 “If you’re shipping beer down to Texas, you don’t know how long it is going to be a the distributor, how long it is going to be on the store shelf, whether it has refrigeration, so you have to make sure everything is done right on our end,” says Leathers. Throughout its history, Leathers and Nabozney have ensured Big Sky retained a close connection to its community by providing support whenever possible. 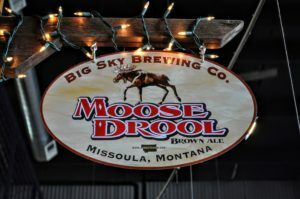 The brewery averages well over $100,000 of giving to the Missoula community each year with youth programs being a primary focus. Activities that focus on an active, healthy lifestyle also received significant support from Big Sky. All age-qualifying finishers of the Missoula Marathon receive a free Big Sky beer at the finish line. Proceeds from Big Sky’s 21st birthday celebration and its summer concert series will be donated to a local mountain biking nonprofit to support trail construction. 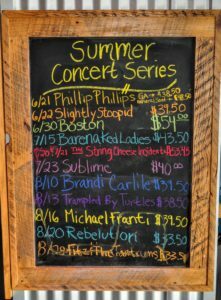 Big Sky will host fourteen concerts this summer, with major acts like Fitz & The Tantrums, Brandi Carlile, and Boston making stops. Wilco and Widespread Panic have made repeat appearances. Still, nearly everything Big Sky penned in its original business plan from 1993 has come to pass. Aside from being a regional brewery covering the western states instead of across the northern states, it has carved out its space in beer as expected. 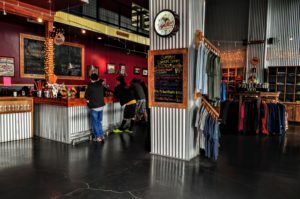 Even as craft beer focuses more and more on “local,” Big Sky has maintained its success in many pockets of the West like craft-rich San Diego, CA. Yet Blair says Big Sky’s success is due to more than the quality of its beer. “It’s my sense that Bjorn can connect the human aspect of beer with a dignity and leadership that ties to both business and community and less about fast money making schemes,” says Blair. Like the methodical, balanced growth Big Sky has exhibited over its twenty one years, Leathers doesn’t see any big changes on the horizon. 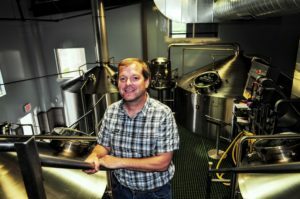 “We like our footprint, we like being a western brewery, so we’re happy where we are for the foreseeable future,” he says. Big Sky is throwing a 21st Birthday Party at Caras Park in Missoula on Friday, June 17. The festivities will include 21 Big Sky beers, including a one-time return of Whistle Pig Red Ale. Leathers promises it will be fully carbonated.